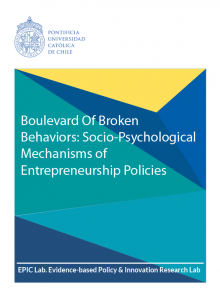 By simultaneously standing on the entrepreneurship, institutions and social influences literatures, this paper explores the use of socio-psychological mechanisms to stimulate entrepreneurial ecosystems. While past research has studied the effects of institutions that use normative, cognitive, regulative and economic mechanisms, this paper assesses the causal relationship between an exogenous treatment that leverages social influences, and subsequent changes in entrepreneurial behaviors. We do this by conducting an in-depth examination of Start-Up Chile, a recent and unorthodox policy that forces a social interaction between domestic and foreign entrepreneurs. We provide evidence about the behavioral differences between two social groups from distinct geographical regions, as well as the assimilation of useful entrepreneurial behaviors as a consequence of the exogenously induced social interaction between these groups. Moreover, we find that entrepreneurial self-efficacy acts as an inverse amplifier in the assimilation of the studied behaviors. Our results shed light on an unexplored landscape in the design of entrepreneurship policies. By challenging current wisdom about the use of conventional mechanisms of influence, we uncover the effectiveness of socio-psychological mechanisms to cause change where the former may fail to do so. Start-Up Chile ¿Una Escuela de Emprendimiento Efectiva? Do business accelerators accelerate growth and failure?